In an extraordinary move, Lesley-Anne Knight, my successor as Secretary General of Caritas Internationalis (CI, the Church's international relief agency), has not been granted the nihil obstat (basically, official approval) by the Vatican's Secretariat of State to stand for another four-year term. There is outrage in the Confederation. According to the statutes, a list of candidates must be presented timeously to the Holy See which then rings the secretary of the applicant's bishops' conference to ascertain whether the candidate is 'in good standing' with the Church. The list is sent to all members of the Caritas Internationalis Confederation (165 members globally, serving 24 million poor people and supporting projects worth US$5.5 billion). The Executive Committee then elects from that list and the successful candidate is presented to the General Assembly for ratification. It is completely within the statutory right of the Holy See to refuse even an incumbent candidate, but not to judge how that candidate has fared in his/her job in terms of management, carrying out the Assembly-approved strategic plan, even serving the poor. That is the task of the members of the Confederation according to its democratic constitution — and according to the members' greater knowledge of the services rendered by the Secretary General. If it were otherwise, the winning candidate would be an appointee of the Secretariat of State, not someone elected by the membership. It seems to me that, in this instance, the Holy See is making a judgment call on the work of the incumbent which is the task of the Caritas membership. If Knight was in good standing with the Church four years ago, what has changed? The reasons given for not granting Knight the nihil obstat (to my knowledge, the first time this has been done to an incumbent in the history of the Confederation) are outlined in a rather oblique way in a letter signed by Cardinal Bertone (the Pope's right-hand man) to all bishops' conferences. It includes a reference to Durante L'Ultima Cena ('During the Last Supper'), a letter signed by Pope John Paul II in 2004, awarding CI 'public, juridical and canonical personality'. This was negotiated and signed during my tenure as we all wished to make our special status with the Holy See clearer so that we could work in a more dynamic, cooperative manner with the social and political structure of the Church throughout the world while maintaining the freedom of action that was an integral part of our Catholic identity. The Pontifical Council Cor Unum, as the Pope's organisation for 'charity', was given a special place — in the original Italian to seguire ed accompagnare, 'follow and accompany' (not 'supervise and guide' as the English translation on the Vatican website erroneously states), the activities of CI. Cor Unum's staff, though not qualified, with one exception, in Caritas' work, were invited to all meetings where they could make a contribution. They attended occasionally and were usually silent as they seemed to regard their task as inquisitorial not collegial. Cardinal Cordes, their then President, was invited to a special Confederation meeting concerning its Catholic identity and mission, held in Poland. He came for a few hours, gave a puzzling speech and then left, citing important work in Warsaw. He in fact spent three days at a meeting of Communion and Liberation (one of the favoured lay movements within the Church) and missed the session on how Caritas regions throughout the world expressed their Catholic identity. By contrast, when Archbishop Diarmuid Martin was Secretary to the Pontifical Council for Justice and Peace, we combined forces to train African and Latin bishops in involving the Church in the World Bank's poverty strategy papers and in peace-building and reconciliation. That unfortunately ended when he was transferred, first to Geneva and then to Dublin. We worked with Archbishop Silvano Tomasi, the Holy See's permanent Observer to the UN in Geneva, in organising a global meeting of grassroots Catholic organisations working with people living with HIV/AIDS. This changed positively the relationship between the Church and UNAIDS. There are many other examples which deny any kind of rift between Caritas Internationalis and the structure of the Church, especially over advocacy positions, and it was Caritas which sought more cooperation, not less. Lesley-Anne Knight, to my knowledge, tried to follow that tradition. Yet the opposite view seems to be the nub of the nihil obstat in Cardinal Bertone's letter. I have no doubt that Christ is at the heart of the work carried out by Caritas in the Church's name, and that is recognised by the people the agency serves — the poor. In Bam in Iran after the earthquake, Caritas Iran together with other Confederation members ran (and still run) a large program to alleviate the sufferings of the people affected. One old lady, a Moslem like everyone in that area, asked one of the Caritas workers for a Bible. The worker said that wasn't possible as it was not the task of Caritas to proselytise (as Pope Benedict wrote in his first encyclical, Deus Caritas Est, 'God is Love') and if she gave her a Bible the authorities would close down the program anyway. 'Respect and love' — two elements perhaps lacking in the current brouhaha. Duncan MacLaren was Secretary General of Cariitas Internationalis 1999–2007 (two terms) and before that Director of International Relations at Caritas Internationalis. He spent in all 11 years in the Vatican. He intends to write a memoir of his time there. While the Vatican's agenda is not clear here we can assume that the present Secretary General has offended in some way that is puzzling to any sane or disinterested observer. Of course it might be enough that she is a woman. Who would know? After many years of supporting Caritas through schools I shifted my donations to Oxfam about three years ago. After reading McLaren's piece I'm happy I did so. From all reports Oxfam is efficient, effective and free of the right wing baggage and burdens that now afflicts so many Catholic agencies. I read this news with great concern. I respect Duncan MacLaren's integrity, so I take it as an accurate statement of the situation. 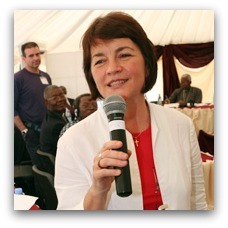 I have heard only glowing appreciation of the leadership and vision of Lesley-Ann Knight as Secretary- General of Caritas Internationalis. Caritas remains one of the jewels in the crown of the Catholic Church, especially in light of the shameful behaviour of many of its clerical members. I have collaborated with CI for several years. I hope that the decision makers within the Vatican will begin to act within their mandate and reconsider the reappointment of Ms Knight to another term. One must very much hope that gender is not an issue in this extraordinary turn of events, especially given that Lesley-Anne Knight has already served a four year term...but such things do appear as such...as any observer of the workings of the Catholic Education Office in Melbourne ...as one example...would note with some consternation. It's the church's mission to preach the Word, but, ironically, it struggles to even articulate...to communicate or, especially, to consult. Translating words into deeds...aspirations into realities is another of its puzzles. We've long been cold-shouldered by the church...after an initial embrace...in our work with people living with HIV/AIDS. It essentially shut down our key care work in Melbourne... with consequences that would have startled the Melbourne archdiocese...snd certainly staggered us. Despite the financial plight that its actions dealt us,we are now engaged in Malawi, South Africa and Uganda....(visit our website at www.aids.net.au) In Malawi we're involved in educational initiatives...we've built 2 primary schools and 2 secondary schools and several other nursery/kindergarten centres...in all helping to educate some 3,000 children, hundreds of them AIDS orphans.In South Africa, we help fund a centre caring for HIV infected children under the age of six..and in Uganda we're helping a smnall Christian group caring for teenagers living with HIV...just this week rescuing a 10 year old boy with HIV, harassed and beaten because of his disease...and providing the funding for a teenage girl with a facial tumour that threatened to kill her. We also helped establish PNG's first AIDS hospice...San Michel..and urged Caritas Australia to deepen its work in that country. How sad. As a past member of the Caritas Council in Australia I have had the opportunity to know Lesley Knight and Duncan MacLaren. Both are fantastic examples of the kind of people that are committed to Caritas an organisation that has earned great respect over the years as a genuine development agency totally committed to overcoming poverty and injustice in our world. Unfortunately the one area in which Caritas is so vunerable is it's Governance, and this failure to reappoint Mrs Knight is a real life example of what can happen. Decisions about the management of the organisation are so often taken away from those who are closest to the work of the organisaion and are put into the hands of those who are only interested in ensuring continuing centralised control. Thus decisions are made on some other basis not related to the work of the the organisation. I have no problems with the Church Hierarchy retaining to themselves the appointment of a Board that they hold reponsible for the management of the organisation within an agreed mission and policies. Having done that surely that Board should be allowed to Govern and take responsibility for key management decisions including the appointment of key staff. As can be seen in this case it does not work like that and the role of "the people of God" who are appointed to Caritas is simply to advise the Hierarchy, who may or maynot accept it. I now sit on a number of development agency Board where we are trusted to manage the organisation and of course held legally and financially reponsible for our decisions--very different from the way the Catholic Church operates. I am sure that Lesley will find a role in another organisation where she will be able to continue her commitment to people and their stuggle to overcome injustice. This is distressing news. Caritas is internationally respected. The Vatican obviously does not wish to reveal the real reasons for this non-approval. The Vatican has become increasingly irrelevant to me in my personal life but I continue to be concerned about the extremely conservative path it is following. It is much more difficult, perhaps impossible for Caritas to ignore the Vatican but how long can the Vatican expect to continue to have loyalty. We are no longer merely sheep to be led. Whenever there was an international crisis of any kind and Caritas was there to help I was able to do my bit by sending a donation confident that it would be well used. I have neither heard nor read anything that would undermine my trust in Caritas nor in how it is run nor in its last two Secretaries-General.So I trust Mr MacLaren's article. Speculation over the real reasons why Ms Knight has not been approved by the Vatican is a fruitless exercise. Is there any way Eureka Street could get a copy of Cardinal Bertone's letter and ask some some exegete to explain the oblique message contained therein? The real mistake was in seeking official status for Caritas with the Vatican. It is hard to imagine what the support of this outdated little theme park could possibly add to the wonderful work done by Caritas for many years. Why can't they simply abjure their official status, and keep operating with the support of the people of God, unencumbered by the Vatican? What a pity! The Vatican almost always seems able to under-achieve even my poor expectations of them/it! Just try and hang on in there; one always needs hope that they/it will improve.. I'm quite disgusted. Sometimes doubt the wisdom of my having become a Catholic about 12 years ago. The Vatican heavies seem more like the Mafia. The 'palace guards' have struck again. I am concerned. Quoting Kevin Dance, "I take it as an accurate statement of the situation". What is not clear to me, though, is "Why"? I know Lesley-Anne Knight and she makes me proud as a member of the federation. In CI, we value transparency; can the reason why be made transparent to us? did they end up giving that old lady a Bible? If not - what's the point? That we withhold Christ from X so we can preach Him more effectively to Y and Z and A, B, and C? What's the calculus here? Where do scripture and tradition back up this tactic? This action is insulting to all Caritas workers, and very disappointing. I am extremely grateful to Caritas for giving me the opportunity to help others, through their dedicated work.. How to change! My hope is for the Vatican to realise it's error and apologise. Preaching Xt means being as Xt to others - to have given a Bible in that situation would have meant added suffering for many. The point of difference was noted and who knows what God can do with that? And a second thought, have you HH put yourself in that type of situation? Perhaps experience might have led you to embrace the Spirit - what is the loving thing to do? - in the face of such a dilemma, rather than statute. It amazes me that too often the hierarchy negate their teaching with what appear to be un-Jesus-like actions. What is the payoff for this? Maintenance of perceived personal and corporate power? If so how Jesus-like is that? As the former Secretary General of Caritas Europa I had the privilege of working closely together with both Duncan MacLaren and with Lesley-Anne Knight. I cannot comprehend this disruptive decision. I would not want to be in the shoes of the person that WILL eventually receive the 'nihil obstat' of the Vatican to fill this crucial post, as this person will face an uphill struggle to be accepted across the 168 member Confederation as the person who is holding the position that the Confederation itself would prefer Lesley-Anne Knight to hold. Plus the next person in this job will have to try and repair the damage that is now being inflicted by the Church hierarchy on Caritas, one of the few Church institutions that was still enhancing the reputation of the Church. This is a sad day indeed. What kind of an insurmountable horrible anti-Christian thing could she have done to raise Vatican objections, that no one else is aware of it?? The only reason that most people would think is that she is not a male cleric!! Given the track record of such male Church leaders the past few decades, theirs is NOT an indication of effective or moral leadership at all! So what are they condemning her for?? Success?? Just one more example of how they are self-exiling themselves from the modern world in a grand snit-fit, just as surely as that Pope who lost control over the Papal States did so when Italy unified itself in the 19th century...!! I don't have much to say about the actual story since I know little about it. I am not sure why the Vatican has to approve her at all? However, I was more sympathetic to the organization before you told me that this is an organization would not give a bible to someone who asked for it. How is that prosletyzing? What about the call of Christ to evangelize? Would the early Christians who were fed to lions not share the gospel with someone who asked for it? No one wants Christians to take advantage of someone's suffering to shove religion down their throats. However, many of us seem to under the illusion that our primary mission is to feed the body. It is not. Yes, we have to care for people's material needs but we should also feel free to lovingly, none-cohercively share Christ. At the very least, we should be able to hand over a bible! Carolyn, well said. My sentiments exactly. And note how the author of the article confuses things by reading Pope Benedict as condemning witnessing to Christianity to those eager to learn about it (as was the old muslim woman) when in fact he was only condemning proselytism understood as forceful conversion - "Those who practise charity in the Church's name will never seek to impose the Church's faith upon others." (D.C.E. 31 C ) If a former Secretary General of Caritas Internationalis can't get this obvious and crucial distinction right, it makes us ponder what the fundamental purpose of Caritas Internationalis was in the years he was in charge. And if his colleague Knight was labouring under the same illusion? Well, kudos to the Vatican. I'd agree with the Caritas worker who wouldn't give the woman a Bible. It wasn't up to him/her to make a decision that might lead to the expulsion of Caritas from the country. I do sympathize with the concerns of those who wonder about the point of giving corporal help without offering Christ too - but our Catholic tradition is one that emphasizes Christ present in human flesh, not in printed words. The Iranian woman did encounter Christ when she encountered those who offered her a cup of cold water in His name, and the fact that she asked for a Bible shows she knew that. Good on the Vatican for fighting back against the progressive bureaucracy that could care less about Christ than for pleasing the prince of the world. All the fish and loaves in the world benefit not if their souls remain in peril. If you wish to worship the United Nations Millennium Development Goals, the Unitarian church's doors are wide open. I am sorry not to agree with the translation Mr MacLaren does of the italian expression "seguire ed accompagnare". Literally and individually "seguire" might to follow and "accompagnare" to accompany, indeed. But as an expression "seguire ed accompagnare" is actually the task of a superior, like a father or a coach, and its rightest translation in english is without any doubt "supervise and guide". Thank you. I know that Caritas International has largely been a success story, given that they bring sanity and relief to the countless suffering and forgotten. There is no dount that the organisation continued to grow and reach out to the voiceless under the guidance of Ms Lesley Anne Knight. I think it is a great pity that she did not get a second mandate. I hope one day she will be respectfully told the reasons. The sad event however, that must not blind us from all that she has been to millions of suffering people. The final evaluation of us all will be left to the One who is source of all, who is Truth. I wish Lesley-Anne Knight my best wishes in whatever she will do and continue to be as a friend to the risen Lord. Three years since Kevin Rudd's National Apology to the Stolen Generations, discriminatory aspects of John Howard's Intervention are still in place. Let's hope that by the fourth anniversary, we are no longer singling out Aborigines for such 'special treatment'.